So, considering lips oils have been on the scene since 2013, I’m a little behind with this post. I’ve just never actively gone shopping with the intention of buying one… perhaps it was the glossy finish and lack of education around the benefits of the product which put me off. 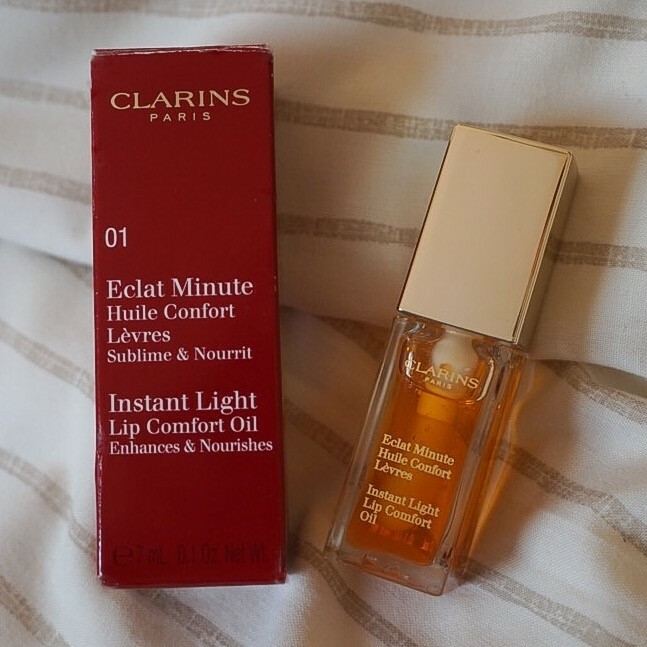 Luckily, the other day I was given the Clarins Instant Light Lip Comfort Oil in the shade ‘Honey’ – a product which, in all honesty, I wouldn’t have picked up off the shelf and invested in had I not tried it first. Having said that, now that I’ve used it for a solid two weeks, I’m definitely sold and wanted to share some key facts about lip oils with you all, incase you’re a little out of the loop… like I was! 1. Although glossy in texture, lip oils can be applied beneath lipsticks and dabbed into the surface of the lips to add a boost of moisture. This is particularly helpful when opting for a drying, matte lipstick. I ALWAYS find that my lipstick maintains it’s smooth appearance longer, thanks to this added step. 2. The Clarins Lip Oil adjusts to compliment the pigment of your natural lip. Therefore, if you’re looking to wear this product on it’s own, you can rest assured the shade will suit you. The good news is, there are also a selection of shades available and each is available for £18 – a fairly reasonable price for a luxury product. Which makes them a great choice for pre-bedtime application (alongside your favourite night cream). Top tip: opt for a neutral/translucent shade like ‘Honey’ if you’re planning to apply this before bed. 4. The finish of a gloss, without the stickiness. You girls know exactly what I mean. When we decide to be brave and wear a shiny lip, the wind gusts and bam… a chunk of hair attaches itself to our glossed lips. While lip oils tend to have a shiny finish, they’re WAY less sticky to the touch, especially 10 minutes+ into the application. 5. They’re extremely easy to apply. The Clarins Lip Oil, for example, has a huge sponge-tip which delivers mass coverage with one dip of the product. They also tend to soothe and provide long-term comfort. The Clarins Lip Oil combines a selection of skin-loving ingredients, including organic jojoba and hazelnut oil, plus star ingredients across the range: Hazelnut, Raspberry, Achiote, Organic Amaranth, Organic Buriti and Field Mint. Was this review helpful? If you’d like to see more posts on the benefits of specific products, please let me know in the comment space below! I have this one and I love it! Great post! I just tried the raspberry one the other day and I love it! I didn’t really know much about lip oils and it was definitely different than I expected. I use it every night before bed now! Thanks for sharing! I loved this post. I love Clarins lip oils! They do some amazing lipglosses as well! I birth this one and I dear it! I dear Clarins lip oils!